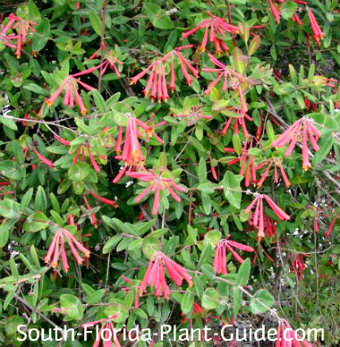 Charming and carefree, coral honeysuckle attracts hummingbirds and butterflies to its flowers and songbirds to its berries. This wonderful wildlife plant is decorated with fringe-like clusters of tubular flowers in bright red-coral. Blooms appear during warm weather and berries are produced in fall. If winter is mild, the vine may bloom intermittently then as well. Full of cottage-garden appeal, this honeysuckle vine can also be grown as a shrub or even a groundcover. 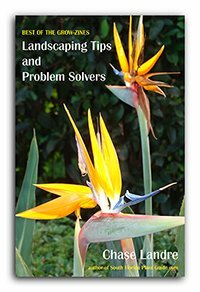 It's a twiner but you'll need to train it where you want it to go - especially on taller vertical supports like a trellis or arbor. Unlike its relative Japanese honeysuckle, coral honeysuckle has no fragrance, though the flowers' nectar is sweet. It's also non-invasive, much more controllable than the Japanese variety. Japanese honeysuckle is the classic fragrant honeysuckle vine - still occasionally available from plant nurseries - but not commonly used because of its aggressive growth in our warm climate. Coral honeysuckle can look somewhat scraggly at times. It's native to Florida and other areas of the United States, and can actually die back in winter and come back in spring in colder areas of the U.S. 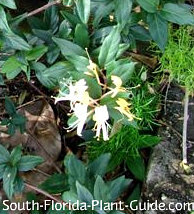 In South Florida, however, it generally stays evergreen in Zone 10B and suffers minor leaf drop in Zone 10A, more in Zone 9B. 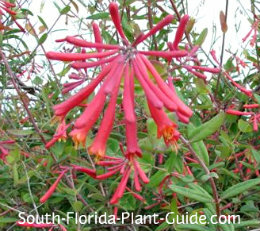 Coral honeysuckle is one of the best South Florida plants for attracting hummingbirds. But birds don't have a sense of smell and it can take a while for them to find nectar plants like this. If you don't get hummingbirds right away, be patient. It might take a few hours or a few years before you get hummingbirds, but once you do they'll put on quite a show. The leaves are dark green with silvery undersides and contrast well with the brightly-colored flowers. Like many vines, this one can be bare at the bottom but a hard pruning once a year will encourage full-to-the-ground foliage. These vines are tame enough to work well in large containers or planter boxes. Plant in full to part sun for the most blooms. This is a fast grower but easily kept in bounds. A cold hardy plant, this vine grows well anywhere in Florida and throughout most of the U.S. If planting a row of these vines, place them 3 feet apart for faster coverage. Place nearby small shrubs about 3 to 4 feet away. Large shrubs and trees should be 4 to 5 feet away. No soil amendments are necessary, though it's beneficial to add top soil and composted cow manure to the hole when you plant. Cut back in spring - usually mid to late March - to encourage lush new growth. Otherwise, no trimming is needed other than an occasional "haircut" for shaping. Water on a regular basis with time between waterings for the soil to dry out a bit. Apply a good quality granular fertilize once or twice a year in spring and/or fall.